Have a complete replica of your database production in case of a disaster. So always the slave will have the role of read only database of course and we can promote as master in case of a disaster recovery or simply move the services to a new server. 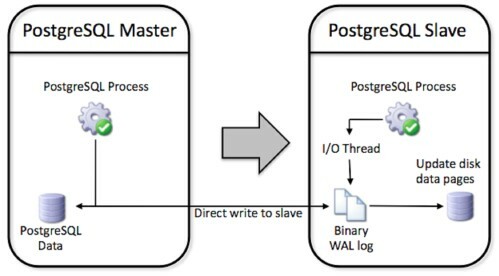 The replication type that I use is the Hot standby (see the different types here), so basically it consist in copy the transaction logs from the master database to the slave server where will be applied immediately after it receives the log.This transaction logs generated by postgresql are located under the directory $PGDATA/pg_xlog/ and consists of binary snapshots with all the changes made on the database. By default are setup in segments of 16MB, but we can increase it if our database is changed with a big frequency.